mr matto: Sadly I'm going to have to say goodbye to this one. Don't live nearby anymore making maintenance tricky. A cache dedicated to Emily Davison, the Suffragette who died at the Epsom Derby in 1913. This cache is near the location where she went under the rails, where there is a memorial. This cache replaces the old multi which I had to archive. Emily Wilding Davison (11 October 1872 – 8 June 1913) was a militant activist who fought for women's suffrage in Britain. She was jailed on nine occasions and force-fed 49 times. She is best known for stepping in front of King George V's horse Anmer at the Epsom Derby on 4 June 1913, sustaining injuries that resulted in her death four days later. 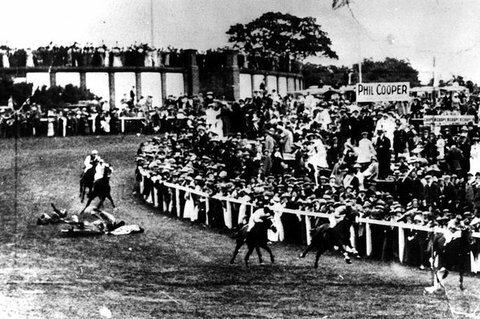 Emily Davison's funeral on 14 June 1913 was organised by the Women's Social and Political Union (WSPU). Thousands of suffragettes accompanied the coffin and tens of thousands of people lined the streets of London. After a service in Bloomsbury her coffin was taken by train to the family grave in Morpeth, Northumberland. Modern historians agree that Davison was trying to disturb the Derby in order to draw attention to her cause, rather than to commit suicide, and 2013 analysis of newsreel has supported the idea that Davison was reaching up to attach a scarf to the bridle of the King's horse. Analysis of newsreel also indicated that her position before she stepped out onto the track would have given her a clear view of the oncoming race, further countering the belief that she ran out in a haphazard way to kill herself.